Reader Mary M. is up against a real problem. HIPAA, for the record, is the Health Insurance Portability and Accountability Act of 1996,1 a federal law that — sigh — has absolutely nothing to do with church records. And what she’s running into is a common problem: a total misunderstanding by laypeople and records custodians about HIPAA, what it is, what it does and what it just doesn’t do. • the past, present, or future payment for the provision of health care to the individual. And even with that very broad definition, absolutely not one bit of the law or the regulations affects church records or church archives at all. And it means, as well, that — unless we’re talking about a church-operated medical clinic or hospital — church records like the parish records Mary would like to see are not affected by HIPAA because the church is NOT a covered entity. And, for the record, a genealogical archive like a local historical society museum is NOT a covered entity. A library is NOT a covered entity. A cemetery is NOT a covered entity. They’re not in the health care business, and even if somehow a piece of health-related information shows up in a document they possess that doesn’t magically morph them into covered entities. So no. HIPAA doesn’t lock up those records at all. Entirely possible that this is being used as an excuse, Amy, which is why getting records access policies clarified from the official representatives of the diocese is really the way to go. I also ran into problems with Catholic church records in Clinton, Iowa. There use to be five Catholic churches in Clinton but they have since lost membership and merged into only one. This church holds all of the records for e previous churches. When I contacted them, the response I got was, “We don’t do genealogy.” They do have a wonderful Catholic History Center located in one of the closed churches. It is staffed by wonderful, kind and generous volunteers. Several years ago, a church member was allowed to create an index of the records and the center has those – sort of. There was no printer and I was not allowed access to the computer database as the computer was old, the software was old, and ??? Anyway, one of the volunteers patiently looked for every record and name I told him and then I would have to write it down as he read it off to me. I could look over his shoulder at the screen as I wrote. There were many mistakes due to unreadable had writing I am sure. The original indexer is now in a nursing home last I heard. When I contacted the church hoping to get a copy of my gr. grandmother’s birth/baptism record, the secretary told me that wouldn’t be possible because she would have to cover up all the other names on the page for privacy – my gr. grandmother was born in 1864!! Really? I was told you could write to Rome and get a letter stating that you can see the church records, if it is your family. I seriously would start with the Diocese first. Going to Rome is overkill if going to Cleveland works. I’ve run into circumstances where they would only give me information on the specific name also. There is an Episcopal Church that I’d like to see records for however I was told they were too fragile for anyone to look at except staff. With a last name of Brown, I’m hoping that the next time I’m in the area I can appeal to them using professional experience, I work at a State Historical Society in the Archives/Library Division, to convince them that I will handle their records carefully enough to get access. I’ve been to two other churches with no trouble so it really varies. But then in the 1980s I went to a courthouse that wouldn’t let me look at probate records. A woman there climbed the ladder, pulled the record and said what do you want to know. How do I know what I want unless I know what’s there? Fortunately policy changed at that courthouse later. I do know there are some sets of records that are too fragile to permit public access to — there are a large number of such records even at the National Archives. But as long as they give SOME access… it’s the ones who won’t allow any access at all that are the major problems. You are right on target in highlighting the definition of a covered entity. 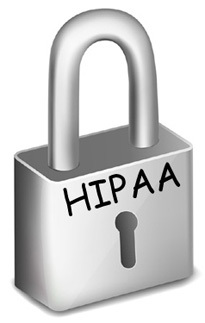 One complication: a library (or more likely archives) that is part of a covered entity and receives records from that entity may become a covered entity itself and have to follow HIPAA rules. Yes, indeed, the HIPAA privacy rule has changed and in a very good way, as reported here in this blog last year (see “Breakthrough for medical genealogy,” posted 8 April 2013). Before the privacy rule was changed, there was NO access to medical information from a covered entity at all: the rule had no end date. So the 50-years-after-death change was very welcome. And, of course, you are also right that a hospital archive may be impacted by HIPAA because of its relationship with the hospital that is the covered entity. Thank you everyone for your comments but most of all thank you Judy for clarifying exactly what HIPPA is. I will write a letter to the diocese’s attorney and will include the information you listed above. I will keep you all posted!! Glad I could help, Mary. Good luck!